Do you remember back in 2000 when scientists promised you that soon a single chip would have the computing capability of a human brain? This didn’t and most likely is never going to happen! Indeed, single-chip performance has hardly evolved over the last decade as processors face a frequency wall due to overheating. 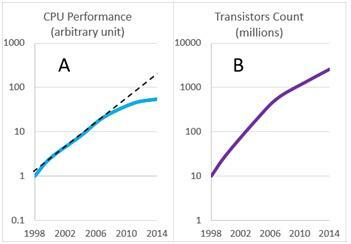 As shown in Figure A below, over the last 8 years Intel CPU performance has improved by a factor of only 3, as opposed to 20 times between 1998 and 2006. Furthermore, even Moore’s law is close to its end (Fig. B). Although physics theoretically allows pursuing transistor shrinking for 12 more years (up to 1.5nm) and even though R&D has demonstrated the 5nm node already, the economics of reducing size is reaching a dead-end. Indeed, investment costs have increased exponentially with every new node now reaching the investment limits of big companies (TSMC recently announced they are investing $16 billion USD in their next technology). So are our PCs, laptops and other electronic devices going to stagnate in the future? Not at all! Future electronic devices won’t be more powerful than they are now, but they will be smarter. Think about the human body. Taken individually, our capabilities (speed, strength, vision, data processing…) are not exceptional. That is the way we combine them, the way we learn progressively from experience and the way we interact with each other that makes us achieve things way beyond our individual capabilities. The same thing is happening in the field of microelectronics, with the “Internet of Things”. By 2020, there will be more than 30 Billion connected devices (10 Billion now). Each of these devices will have very little computing power, but together they will provide a lot of information to make our PCs, laptops and smartphones smarter. From now on our electronic devices won’t be characterized anymore by their computing power, but rather by their ability to collect large amounts of data, at a high-speed and from multiple sources. This trend is perfectly illustrated by the evolution of computer component characteristics. While CPU performance has “only” improved 50 times over the last 16 years, the capacity of solid-state-drives (SSD), which are 10 to 100 times faster than traditional hard drives, has increased more than 10,000 times (Fig. C)! The network capabilities (Wi-Fi, Ethernet, fiber optics…) followed a similar trend to allow the global Internet traffic to increase by more than 5,000 times in 16 years (Fig D). So, when you go buy your next electronic device, you don’t need to look for the best CPU anymore. Fast memory storage (SSD) and state-of-the-art connectivity, is what will make your device the ‘Next Big Thing’! 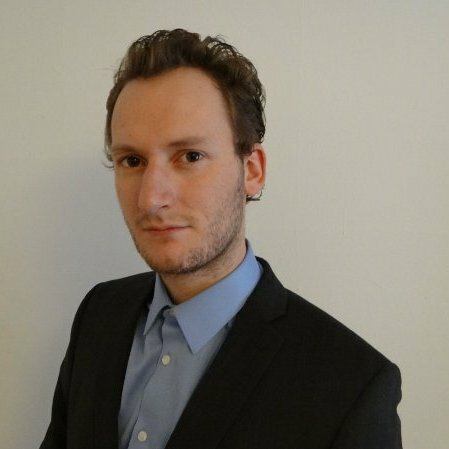 Francois Callewaert is a PhD candidate in the department of Electrical Engineering at Northwestern University. His research focuses on novel optoelectronic devices for advanced sensing capabilities. His interests cover nanotechnology, optic/electronic devices and systems and renewable energy.